The last Super Aguri car is a slight evolution of the ill-fated Honda of 2007. As Honda already struggled with their Honda RA107, it comes with no surprise that Super Aguri immediately lacked pace and were at the back of the grid. As money problems didn't help, the team withdrew after the fourth round of the season. 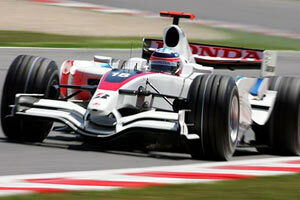 It was at this last Grand Prix at Catalunya, Spain that Takuma Sato finished 13th, Super Aguri's best result of the year. Chassis construction: Moulded carbon fibre and honeycomb composite construction incorporating front and side composite impact structures; Integral roll protection structures; Fully enclosed fuel cell. Bodywork construction: Composite multi piece sidepod and engine cover, separate carbon floor section, structural composite nose box and composite wings. Rear suspension: Wishbones, pushrod operated torsion bars and dampers. Mechanical anti-roll bar.